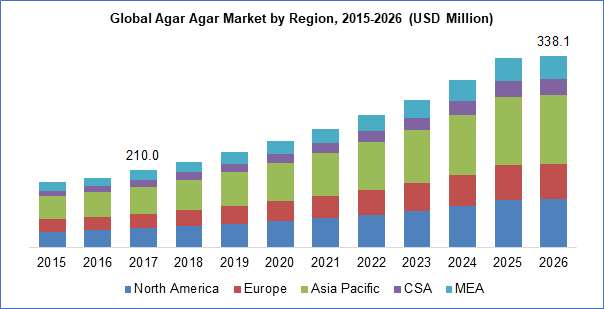 The global agar agar gum market size was valued at USD 219 million in 2017 and is estimated to grow at a CAGR of 5.0 % during the forecast period. Agar-agar hails from the group of galactan polysaccharides, a type of complex sugar polymers that contains galactose molecules in the range of 22. Bacteriological grade agar is used in bacterial molecular genetics applications such as plant tissue and mammalian cultures, bacterial and yeast formation studies, auxotrophic studies, as well as clinical applications. Agar agar gum is very frequently used as an additive or ingredient in dairy products namely smoothies, infant formulae, pudding, mousses, curd, spread, custard, cream, and yogurt. The properties of agar agar gum to stabilize and solidify dairy products are a key factor triggering the consumption of the product in the global market. In addition, it’s non-nutritive characteristics such as no-carbohydrates, no-fat or no-sugar have boosted the demand for this product in health-conscious consumer segments. The industry is projected to witness better growth prospects between 2018 and 2025 as compared to the previous five years. 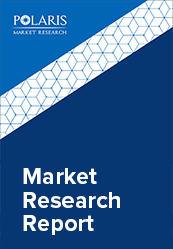 Enhanced execution of sales, efficient pricing of products, and research development are the key strategies being exercised by market participants to acquire a greater market share for their produce. However, emphasis on high-quality products at low costs, and increasing buyer bargaining power are a handful of challenges that are poised to adversely impact the supply chain. Especially in the food industry, demand for these products is anticipated to be driven by the thickening and gelling properties exhibited by the product. In this industry, more preference is given to these products over polysaccharides, owing to the fact that these products has large hysteresis between the melting and setting temperatures, which is fairly uncommon with polysaccharides. However, frequent and continuous consumption of these products might give rise to specific health concerns among humans. A major driver in the agar agar gum market is growing demand for the product in confectionery and baking industry. Using these products in the production of jellified confectionery products (which mainly contributes to prolonged shelf life of the product and consumer purchase decision making process) makes the end products more palatable and less sticky. The wide variety of these products forms available is likely to add up to the varied applicability of these products across diversified domains. Additionally, the development of new products in the bakery and confectionery industry is a top factor anticipated to drive market growth over and even after the forecast period. The agar agar gum market participants, especially core manufacturers are investing heavily in research and development, with a view to brainstorm on new food forms that may appeal to consumers. Moreover, technological advancements such as the introduction of metal scrappers provide room for harvesting large quantities of seaweed without putting in much effort. Several other techniques have been specifically developed for dewatering, pretreatment and cleaning of agar agar gum extracted from seaweed. There’s also a technology in place known as microwave-assisted extraction (MAE) which makes use of microwave energy to heat solvents related to the samples. Powdered agar agar gum accounted for nearly 85% of the market share in 2017, and is expected to grow significantly over the forecast period. Clear color powders are widely utilized for several scientific and industrial application that include plant tissue culture media and bacteriological cultures. Manufacturers who produce pure vegetarian, vegan, halal, and kosher foods in large quantities usually make use of agar agar gum strips or bars, as such gum stirps or bars makes a great alternative for gelatin-derived dairy-based products. Agar agar gum is also recognized for fostering prolonged shelf-life to processed and frozen meat products, thus increasing the value of the end-product. A Jakarta-based company, PT. Agarindo Bogatama is a major market player in the agar agar gum market involved in the production of such powders which is marketed to different domains in the food industry such as dairy and liquid desserts, meat, confectioneries, and bakeries. Regardless, squares and strips are largely used in households and by small scale domestic manufacturers in the production of traditional dishes. The increasing food processing sector and rising disposable income of the consumers in Asia Pacific is projected to aid the market growth in this region. Europe is projected to witness a dominant growth, since European manufacturers take advantage of the high-quality content suppliers from partner countries, a positive consequence of the Swiss Import Promotion Program (SIPPO) regulated by the State Secretariat for Economic Affairs (SECO). Europe is being sighted as a key area for food business by foreign investors and venture capitalists. Other existing market participants are trying to gain visibility by participating in food ingredients exhibitions and public shows. New product development and capacity expansion are the two key success strategies adhered by market participants. Key manufacturers in the industry with a significant agar agar gum industry share in the industry include Sobigel, Setexam, P.T. Aagarindo Bogatama, Proagar, Industrias Roko, Iberagar, Hispanagar, Asahi & Co., Algas Marinas, Agar Del Pacifico, TIC Gums, New Zealand Manuka Group, and Meron.